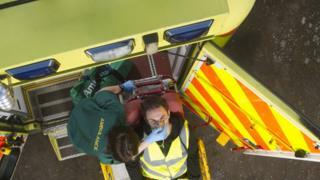 Ambulance crews are finding it "increasingly difficult to cope", an audit of the service in England says. The warning by the National Audit Office comes just two months after a BBC investigation highlighted increasing delays answering 999 calls. The NAO said rising demand, recruitment problems and wider NHS pressures meant crews were failing to hit targets. It comes as NHS bosses are looking at relaxing the eight-minute target for calls where it may not be necessary. In November the BBC revealed ambulances were increasingly being delayed outside A&E units as hospital staff were too busy to take on the patients being brought in. And the investigation found just one of the 13 services in the UK was meeting its key target - the eight-minute goal to reach the most life-threatening cases. This NAO review just looked at performance in England. It too highlighted these problems and urged NHS bosses to review what was happening. It pointed to the discrepancy between the rise in demand - 30% over four years - compared to the rise in budget - 16% over the same period. NAO head Amyas Morse said action was needed as ambulances were a "vital" part of the service. Christina McAnea, of Unison, which represents ambulance staff, said: "There's simply not enough money to cope." NHS England said steps were being taken. Ambulances have been given longer to assess calls before a response needs to be sent - about a quarter of crews are called back before they reach the scene because call handlers have to make quick decisions about who needs an emergency response. Three ambulance services - South Western, Yorkshire and West Midlands - are piloting a scheme which is seeing some urgent calls, such as strokes and fits, re-categorised as not needing an eight-minute response. Evidence suggests such quick responses are not necessary in these cases. Prof Keith Willett, of NHS England, said: "These trials are designed to makes sure ambulances focus on the right priority - getting to the most urgent patients in the quickest possible time and improving the service to all patients who dial 999."